Game keeper admits shooting buzzard. Kerr, from Dundee, pleaded guilty to intentionally killing a wild bird and possessing banned pesticides. Perth Sheriff Court was told that Kerr had decided to kill the buzzards after they started killing the pheasant chicks being bred on Redmyre Estate in Abernyte, Perthshire. As well as using a rifle to shoot one bird, Kerr had also obtained banned poisons. He admitted to killing the buzzard with a rifle on 9 September 2009 and possessing the pesticides Carbofuran and Alpha-Chloralose. When police questioned Kerr he produced plastic tubs containing the two illicit pesticides he claimed he had been given by a friend and planned to use to kill buzzards. The police were about to search Kerr’s car when he produced a dead buzzard. It had a clearly broken wing and Kerr admitted shooting the bird with his rifle. Solicitor Thomas Cruikshank, defending, said Kerr was in charge of stock control and the buzzards were “causing concern” by preying on the pheasants. “He had tried legitimate methods to avoid predation by the buzzards but these had not worked. He was given the pesticide for possible last resort use,” he said. 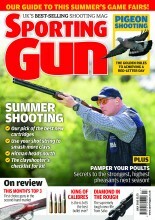 Talk to other readers about game keeping and pest control!